Christmas in Dairyville 2018 begins November 30th-December 2nd and continues the following 2 weekends. A HO, HO, HOLIDAY TRADITION. During the holidays, Dairyville, a replica of a western frontier town at Alpenrose Dairy, transforms into a winter wonderland. Animals are on display in nostalgic Storybook Lane, vintage storefronts, local choirs singing, holiday movies in the Opera House and, of course, Santa. 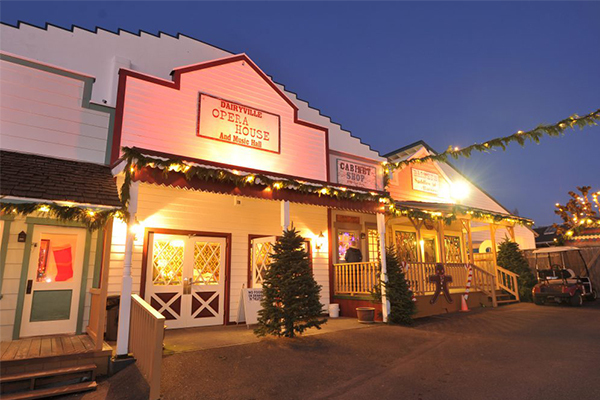 Christmas in Dairyville is where lasting memories begin. The history of Alpenrose Dairy dates back to 1891 when Swiss-born Florian Cadonau, began delivering milk in three-gallon cans by horse-drawn wagon from their dairy farm in southwest Portland to customers throughout the city. In 1916, it officially became a family business when Florian’s son, Henry Cadonau and his wife Rosina took ownership and named it Alpenrose Dairy. The Cadonau’s chose the name Alpenrose after the Switzerland national flower, as a tribute to Florian and their Swiss ancestry. Thirty years later, Henry’s son, Carl Cadonau Sr., stepped in as the new head of Alpenrose and began hosting family-orientated events at the dairy, many of which remain Portland traditions to this very day. In 1962, Alpenrose sponsored its first ever Easter Egg Hunt, inviting the whole community to take part as a way of thanking them for their support. The dairy is also home to Alpenrose Field, where the Girls’ Little League Softball World Series has been held since 1993. Under Carl’s supervision, the dairy processing facility moved, giving way to an ever-expanding campus. A Velodrome bicycle racing track, Quarter Midget Race Car track, western-town Dairyville and Storybook Lane, were all constructed as the former dairy became a hub for community events. More than one hundred years later, Alpenrose Dairy remains a family-owned business led by Carl Cadonau Jr., Rod Birkland and many of Florian’s great-great-great-great grandkids. Over six-generations of family members carry on the Alpenrose business. Continuing the Alpenrose tradition of providing local families with the finest and freshest local dairy products and maintaining the family’s calcium-rich heritage. Trying to decide what to do in Portland? Check out events like this one, just a short distance from our Portland luxury hotel. A stay at Hotel Eastlund means you’ll be across the street from the Oregon Convention Center, next to the Moda Center and close to the best destinations, restaurants and attractions Portland has to offer. Whether you’re here for business, pleasure or looking for an event space in Portland, we look forward to helping you discover this beautiful city.